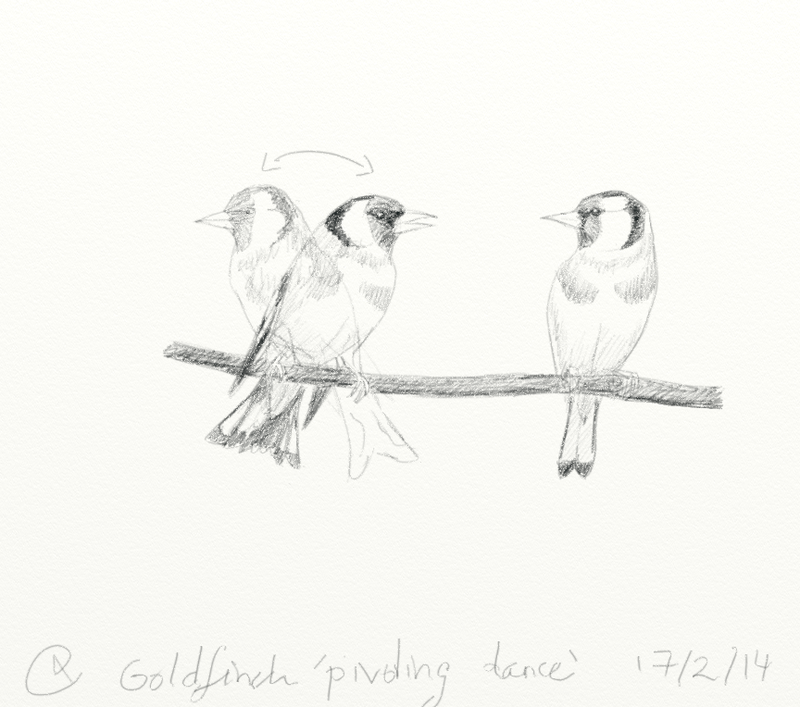 A trio of goldfinches came to the feeders today. One of them, while it waited on nearby branch to feed, carried out a curious 'dance', repeatedly swinging its body from one side to the other while it called. I looked into this and found out the dance it's got a name: 'pivoting display'. In a courtship context, the display is carried out by the male and he swivels towards and away the female as he swings. The wings are somewhat lowered - which makes the golden bars more visible - and the tail spread, showing the white patches. Female also pivots, and when both sexes carry out the display it may end in copulation. The pivoting display is also used in aggressive contexts, and maybe the goldfinch was becoming impatient waiting by the feeder. I shall keep an eye on my visiting goldfinches and see if I can record this behaviour. I found a little video showing the behaviour in a charm of goldfinches. Check the individual at the bottom of the image from s 36. And a great video of a pair of captive goldfinches courting.